Markku Jokinen was born in 1959 in Jämsänkoski, Finland. He earned his M.A. in Education, Certified Teacher of Comprehensive School, from the University of Jyväskylä in 1991, became a Certified Teacher of the Deaf in 1992, and did postgraduate work in Linguistics, Psycholinguistics, and Sign Language Linguistics at the University of Rochester from 1992-93. He is currently pursuing a doctorate. In 2012, he received an honorary Doctor of Laws degree from Gallaudet University. He served as President of the World Federation of the Deaf from 2003 to 2011, participating in the historic ICED 2010 in Vancouver that offiicially repudiated the resolutions adopted at the second ICED (the infamous 18890 Congress of Milan, which sought to banish sign language from the classroom, replacing it with Pure-Oralism). He is currently President of the Finnish Association of the Deaf, and advocating for Finland's signing of the UN Convention on the Rights of Persons with Disabilities, which is still unratified there (and was outvoted in the USA last year here). Jokinen is from a bilingual Deaf family; he has a hearing brother, who became a professional sign-language interpreter. "Finnish Sign Language (FinSL) has been one of our home languages. My parents were active in the Deaf Community, especially with other parents of deaf children in our community. They supported the parents in learning FinSL and met their deaf children often. Later they actively participated in a Deaf club, Jämsänjokilaakson Kuurot ry. So, all my life I have been in quite close connection with people and organizations of the Finnish Deaf Community. In my youth I was very actively involved in sports (both hearing and deaf). Swimming, rowing, and cross-country skiing have been my favorites. "I never went to a deaf school, perhaps because I learned to read very early and I managed to use Finnish spoken language. It seems that my parents were advised that I needed to study in hearing schools. This education gave me a quite good foundation for my further studies and working life. For example, I studied several languages in my school years: Finnish, Swedish, English, German, and Russian. When I started my university studies in 1981, I used sign-language interpreters for the first time. Oh, what an experience it was! Suddenly I was able to follow exactly what a professor and other students said. To me, it was a communication revolution! After that, I never again went to any more or less official group situations without an interpreter! "One of my mentors is Dr. Liisa Kauppinen, from whom I have learned so much and received endless support. Mr Lars-Åke Wikström from Sweden, Asger Bergmann from Denmark, Ted Supalla, Tom Humphries, and Carol Padden from the USA, and many, many more wonderful persons from around the globe have taught me a lot in many ways although they perhaps didn’t intentionally do so. In short, you learn a lot when you are surrounded with people who are more experienced than you. I want to stress that I also learned a lot from hearing persons during my university and workplace years in the areas of education, language, culture, community, disability, and human rights. "My years as a President of WFD were extremely mind-expanding! I learned a lot about what it means to be a deaf person in all corners of the world. I learned that we have a lot in common. Differences in cultures, habits, traditions are superficial. Inside we are same. We all have same the value as human beings and we all are really equal. "Our long-term advocacy work in the Finnish Association of the Deaf with Finnish authorities has gained good results with the Language Policy Programme of National Sign Languages in Finland. Legally and politically, the status of deaf people is fairly good, but we still struggle with accessibility and discrimination in everyday-life situations. The use of cochlear implants has naturally led to an increase in the number of mainstreamed students here. We now have to analyze this situation by working with the National Board of Education through a survey, finding out the exact number of all sign-language-using students and their educational arrangements. After this we can hopefully exert a positive influence on Finnish education policy." 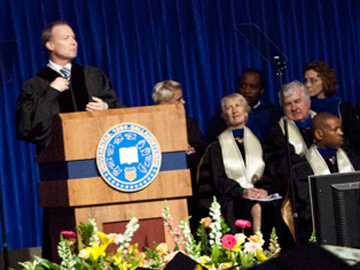 The honorary doctorate he received at Gallaudet University "has given a powerful boost to my work and goals. Receiving such an honour from the Deaf Community is always inspirational and rewarding. Thank you so much, Gallaudet University!" He continues to work towards getting the CRPD ratified by Finland. A savvy user of social media, he notes, "I think it is revolutionary to deaf people to live during this era of social media and Internet, because we can receive and disseminate information more quickly than ever before. The more we know and influence, the more power we have to lead and shape our lives."